This is an exciting time to be involved in the IBM i revival. In late October, 125 IBM i professionals arrived at the RPG & DB2 Summit in Minneapolis, primed to embrace the "i can, can you?" challenge. 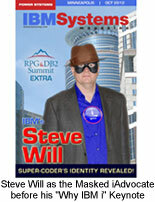 The group buzzed with energy as we worked at increasing the relevancy of IBM i applications to our organizations. Take the photo tour of the Summit to witness that energy. The attendees took full advantage of the Headstart Seminars and 55 technical sessions, and most rose before dawn to make the 8 am Early Bird classes. This group worked hard! In addition to learning technical how-to details, we were all ears as IBMers Steve Will (the masked iAdvocate) and Mike Cain (our mild-mannered iAdvocate Superman) introduced us to critical advocacy skills needed to advance our own careers and our platform of choice. Steve's Keynote and Mike's iAdvocate Tutorial and Discussion left us with visibility into the data and the skills objectives we need to become effective iAdvocates ourselves. Visit the iAdvocate Resources page for free access to their presentations and source materials. All work at the Summit? NEVER! We re-energized with light-hearted activities and networked over the Sofitel's amazing meals and desserts. Two attendees even discovered they were related as they chatted! Bob, the voice of SiD, helped Jon, Paul and Susan give away dozens of door prizes. We earned Hexbugs and collected nostalgic candy such as Teabury and Clove gum, Mallo Cups and Atomic Fireballs. Our vendor partners treated attendees to product knowledge and several door prizes. We couldn't do this without the expertise, humor and loyal support of our guest speakers. Scott Klement, Mike Cain, Kent Milligan, Barbara Morris, Aaron Bartell, Bruce Vining, Claus Weiss, Gene Cobb, Doug Mack - well done! And thanks to IBM Systems Magazine for their help with the photo badges, iPro Developer for contributing a free eLearning course, and to both publications for their ongoing support of System i Developer. As for the future - be sure to mark your calendars for March 19-21, 2013 so you're free to join us at the next RPG & DB2 Summit at the Crowne Plaza in Atlanta. Sign up for our email list to stay apprised of the details. We also saw a marked uptick in the realization that DB2 for i functionality is grossly underused as a tool to address imminent business issues. Watch this space for additional DB2 for i education opportunities!